Entire industry must work from the bottom up to transform. Transformation of the property industry is “taking too long”, and a new approach has been launched. This is according to Darc Hattingh, a development manager with Eris Property Group and convenor of a job shadow programmed organised by the youth in Property Association (Yipa). Part of the reason for the slow transformation he says is the industry has been trying to change itself from the top down.” We’ve been focusing on those previously disadvantaged individuals who have already made it into the sector. However, there are not enough black professionals coming into it in the first place to have much of a meaningful impact on transformation”. What is needed is for the industry to work from “the bottom up” and expose high school pupils to it when they are considering their career or tertiary education options, Hattingh says. Yipa has teamed up with the Western Cape Property Development Forum to provide the underprivileged pupils with the opportunity to shadow Cape Town Property professionals. “By positivity influencing pupils we can encourage them to look past the bricks and mortar to see the engine room that creates and maintains property assets.” The first two programmes, run in October last year and April this year, saw a total of 38 pupils from Khayelisha schools working with several of the most prominent property companies in the Western Cape. The experience was eye opening on all fronts, says Hattingh. The students were “mostly oblivious to fundamental property concepts we take for granted”. “For instance, property rental was a seemingly foreign concept as they assumed every occupier of a property owned it,” Hattingh says. This was one of the surprising discoveries made by property professionals. And there were others. The experience has enabled the participating property companies to better understand the lives and circumstances in which these pupils live, and it helped them realise the serious dire need for affordable housing in South Africa. Hattingh says the initiative is “breaking barriers on both sides” by highlighting the plight of many South Africans while providing a glimpse into the real business world of the property sector. 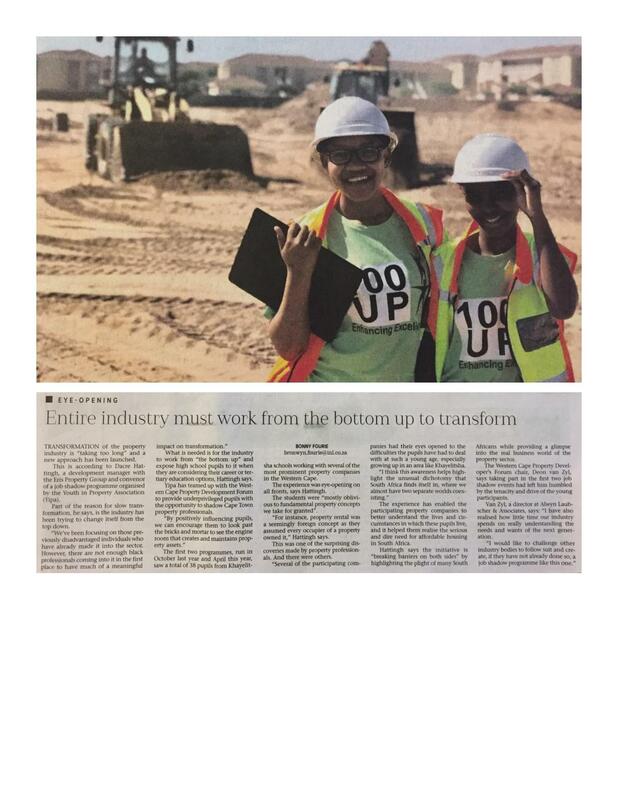 The Western Cape Property Developer’s forum chair, Deon Van Zyl, says taking part in the first two job shadow events had left him humbled by the tenacity and drive of the young participants.